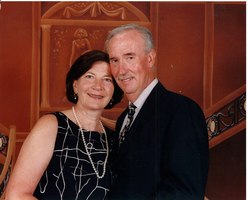 Provide comfort for the family of Philip Turturici with a meaningful gesture of sympathy. Phil Turturici of Caledon, Ontario passed away peacefully on April 10, 2019 at the Brampton Civic Hospital. Born in 1947 in Trabia, Italy. Phil is predeceased by his parents Anthony and Francesca (nee Mauro) and his sister Rose. Phil was an extraordinary husband, father, grandfather, uncle and friend. He will be sadly missed by his wife Annette, daughters Valerie (Steve Saunders), Michelle (Mark Armstrong) and grandchildren Andrew, Emily, Ethan, Nathan and Gavin; sister-in-law Elaine (Bill Cronkhite); brother-in-law Jeff Stairs (Sonia); uncle of Toni, Lianne, Jessica (Patrick), Drew, Jamie and Justin; great-nephews Josh, Brock and Callan. Fondly remembered by Joanne and Mark Scully. Survived by his brother Sam (Carol). Phil worked for 30 years for the Federal Government in several capacities and enjoyed the last eighteen years working with Annette in their antique business at Inglewood Antique Market in Caledon. Phil enjoyed playing golf, travelling and spending time with family and friends. Funeral Service will be held at the Dods & McNair Funeral Home, Chapel & Reception Centre, 21 First St., Orangeville on Sunday, April 14, 2019 at 1:00 p.m. with visitation beginning at 12:00 p.m. In lieu of flowers the family would appreciate donations be made to the Canadian Cancer Society. Provide comfort for the family of Philip Turturici by sending flowers. Our deepest condolences and prayers to the family. Sad to hear of the passing of dear friend, Phil. My deepest condolences to all the family. May he Rest In Peace.